This is the critical initial step. When a coating fails before the end of its expected service life, it is most often due to incorrect or inadequate surface preparation. In the galvanizing process, zinc simply will not adhere with a steel surface that is not perfectly clean. At Ohio Galvanizing, we cannot take responsibility for properly galvanizing your product unless we correctly clean it first. Caustic Cleaning. Your product is dipped in a hot alkali solution to remove organic contaminants such as dirt, paint markings, grease, and oil from the metal surface. It is then dipped in a rinsing tank. Note: epoxies, vinyl, asphalt, or welding slag must be removed before galvanizing by grit blasting, sand blasting, or other mechanical means. Pickling. Your product is then dipped in a dilute solution of hydrochloric acid. Called pickling, this step removes scale and rust from the steel surface. It is then dipped in a second rinsing tank. Fluxing. This is the final surface preparation step in the galvanizing process. Fluxing removes oxides and prevents further oxides from forming on the sur­face of the metal prior to galvanizing and promotes bonding of the zinc to the steel or iron surface. 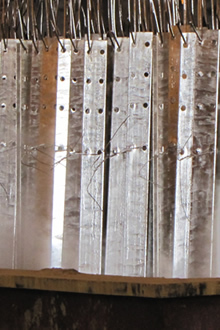 At Ohio Galvanizing your product is dipped or pre-fluxed in an aqueous solution of zinc ammonium chloride. The material is then air dried. In this step, your product is completely immersed in a bath consisting of a min­imum of 98% pure molten zinc. The bath chemistry is specified by the American Society for Testing and Materials (ASTM) in Specification B6. Your material is immersed in the bath long enough to reach bath temperature, or about 850°F (454°C), then withdrawn slowly from the galvanizing bath whereby the excess zinc is removed by draining. The chemical reactions that result in the formation and structure of the galvanized coating continue after the articles are withdrawn from the bath as long as the product is near the bath temperature. Your product is then cooled in a quench tank or ambi­ent air immediately after withdrawal from the bath. The two properties of the hot dip galvanized coating that are closely scrutinized after galvanizing are coating thickness and coating appearance. A variety of simple physical and laboratory tests may be performed to determine thickness, uniformity, adherence, and appearance. Products are galvanized according to long-established, well-accepted, and approved standards of the ASTM. These standards cover everything from the minimum required coating thicknesses for various categories of galvanized items to the composition of the zinc metal used in the process. Testing methods and interpretation of results are covered in the publication, The Inspection of Products Hot Dip Galvanized after Fabrication, published by the American Galvanizing Association (AGA). Because we are a member, this publication is available from Ohio Galvanizing. According to numerous national and international studies, hot dip galvanizing produces no significant changes in the mechanical properties of the structur­al steels or welds commonly used throughout the world. The galvanized product's underlying steel is chemically and metallurgically equivalent to the uncoated steel. ASTM specifications establish minimum standards for the thickness of galvanized coatings on various categories of items. These minimum standards are routinely exceeded by galvanizers due to the nature of the galvanizing process. Some factors influencing the thickness and appearance of the galvanized coating Ohio Galvanizing can control-steel surface condition, bath temperature, bath immersion time, bath withdrawal rate, and steel cooling rate. Some factors are inherent in the product, such as the chemical composition of the steel and any cold working of the steel prior to galvanizing. The chemical composition of the steel being galvanized strongly influences the thickness and appearance of the galvanized coating. For example, silicon, phosphorous, or combinations of these two elements can cause thick, brittle galvanized coatings. The carbon, sulfur, and manganese content of the steel also may have a minor effect on the galvanized coating thickness. The combination of the elements mentioned above, known as "reactive steel" to the galvanizing industry, tend to accelerate the growth of zinc-iron alloy layers. This may result in a finished galvanized coating consisting entirely of zinc-iron alloy. Instead of a shiny appearance, the galvanized coating will have a dark gray matte finish that provides just as much corrosion protection as a galvanized coating having the common bright appearance. The graph below is a plot of the thickness of the galvanized coating against the expected service life of the galvanized coating under outdoor exposure conditions. Most galvanized applications are 4 mils of thickness minimum per surface. The expected service life is defined as the life until 5% of the surface is showing iron oxide (rust). At this stage, it is unlikely that the underlying steel or iron has been weakened or the integrity of the structures protected by the galvanized coating otherwise compromised through corrosion. The best way to ensure the safe, effective, and economical galvanizing of steel products is for the designer, fabricator, and galvanizer to work together before the product is manufactured. Ohio Galvanizing can assist you with the practices that should be followed in designing products for effective and safe galvanizing. These practices are easily applied and in most cases are routine methods used to ensure maximum corrosion protection...and the most cost effective galvanizing process for you. Most ferrous materials are suitable for galvanizing. These include cast iron, malleable iron, cast steels, and hot and cold rolled steels. Iron and steel products to be galvanized after fabrication range from small pieces of hardware to large welded steel assemblies. Ohio Galvanizing utilizes kettles that are 30 ½ feet long by 5 feet wide by 7 ½ feet deep. If your product(s) is too deep or too long to fit into the kettle, it is often possible for us to utilize double-dipping to galvanize products that exceed the dimensions of our kettle. Should you have questions about a product's galvanizability, contact Ohio Galvanizing today for a no-cost consolation. Galvanizing requires that cleaning solutions and molten zinc flow into, over, through, and out of fabricated steel products. Designs that promote the flow of zinc are optimal. Filling and vent holes must be provided to prevent pickling or other cleaning bath fluids from becoming trapped in an article. It is best to avoid narrow gaps between plates, overlapping surfaces, and back-to-back angles and channels. When overlapping or contacting surfaces cannot be avoided, all edges should be completely sealed by welding but provided with a small hole or a short gap in the welding to relieve pressure build-up in overlapping areas that exceed 16 square inches. For more in-depth information, AGA's publication "The Design of Products to be Hot Dip Galvanized," or their CD "Designing with Hot Dip Galvanized Steel," are available from Ohio Galvanizing. In addition to covering the essential considerations for proper design and providing specific technical specifications and details, illustrations demonstrate both proper and improper design practices. These practices are also described in ASTM A 143, A 384, and A 385.